This particular post stems from the above tweet. Most educators understand that formative assessments can be a valuable tool in teaching and learning. I’ve found that formative assessments play a pivotal role in my instruction as an educator. Specifically, I’ve found that exit cards can be a powerful tool in analyzing student learning. If you’re unfamiliar with the idea of using exit cards as a formative assessment tool, click here. Below, I’ll give you a brief overview on why and how I use exit cards in the classroom setting. It’s not required, but I feel as though exit cards give me an opportunity to quickly assess students’ understanding of the objectives taught for a particular lesson. In my experience exit cards work well near the end of a lesson. During that time, the students fill out a small half sheet of paper that includes 1-3 questions related to the objectives taught during a specific lesson. The questions may be multiple choice, but they generally include some type of written response that demonstrates an understanding of the objectives. I don’t grade the exit cards (A or B …) instead I put a check on exit cards that show understanding and a subtraction sign that reminds the student and teacher that extra support may be needed. The exit cards are placed in each student’s portfolio and can be utilized during parent/teacher conferences. Periodically, I may conference with a student to review their exit cards and set goals based on the conversation. Students are also given an opportunity to review the exit card slips before an assessment and may even journal about their academic growth in my class. I may give exit cards once or twice per week or more frequently as needed. The exit cards can be utilized to engage students in self-reflection activities (journaling or individual student conferences). 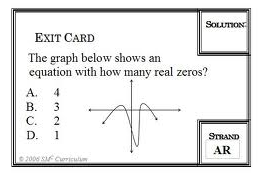 The exit cards can also be reviewed in class to give examples of correct answers. I’m also planning on using exit cards beyond math and incorporate them into other content areas. Here is one resource that may be beneficial in communicating what makes a “good” exit card with question and response examples. I was also thinking that exit cards could be created and shared with a team of teachers and discussed during grade level meetings. A nifty, quick, formative assessment tool to use every lesson.